Primer is one heckuva cool movie. Two engineers who dabble with physics experiments in their garage make a mind-bending discovery after finding fungus growth on a weeble. Seriously. 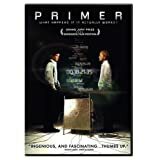 As many critics have pointed out, Primer is the most reality-grounded SciFi film since Kubrick's 2001: A Space Odyssey . The coolest thing about Primer, however, is that is was made by a real software engineer named Shane Carruth. It was his first film, and his budget was a mere $7,000. It took Carruth nearly 2 years to edit the film, but the resulting story and cinematography (especially the excellent lighting) make him look like a seasoned pro. He discusses everything in detail (himself!) on the official Primer Movie message board. I should note that the DVD I initially purchased had a defect that prevented the movie from playing past chapter 4. After I filed out the exchange form on amazon.com, I received a prompt reply and apology. They shipped me a brand new copy via 2-day air, and that disk plays without error. I'm very pleased with amazon's customer service. You have to explain the movie to StickyC and me. We saw it at Gnomedex last summer and got lost about half way through. What's the deal with the car alarms? Heck, this is like Momento - I'll need to watch this one a couple more times to figure it out myself. As for the car alarm, I think that was Aaron's double breaking in to his own car. I think.